THE LATE GREAT ARUAH TOK GURU NIK AZIZ….I remember vividly and with much fondness, the reverence I and so many Malaysian had for this man. It matters not the beliefs you hold nor the political inclinations you have…with him leading PAS we had with us some one whom we trust and can depend on in our corner. Without him PAS has descended into the pit of religious intolerance and religious arrogance that have consign PAS back to the days when it was an insignificant political entity able only to live from hand to mouth in that East Coast state that many of us refer with disdain as being “out of sight…out of mind”. 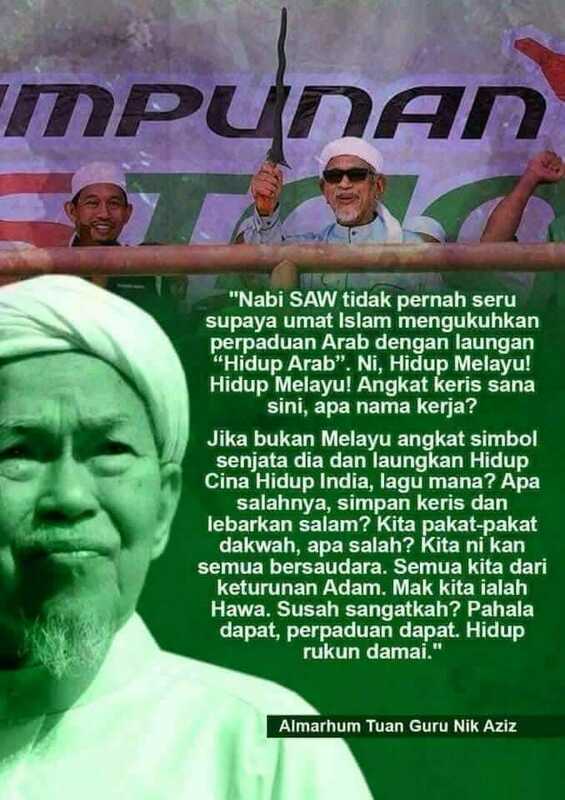 PAS under Hadi the Towel head Idiot, has now become for its leaders what Umno has been for its leaders for as long as I can remember – a source of dedak. I have no doubt that after GE14 PAS will go begging bowl in hand to umno for handouts while its leaders enjoy the spoils of political office that brings with it Four Wheel Drives, Mercedes, Audis….Mansions….and the more mundane things that men of the cloth usually seek from life….second, third or maybe four wives, mistresses and girlfriends. Enough said.